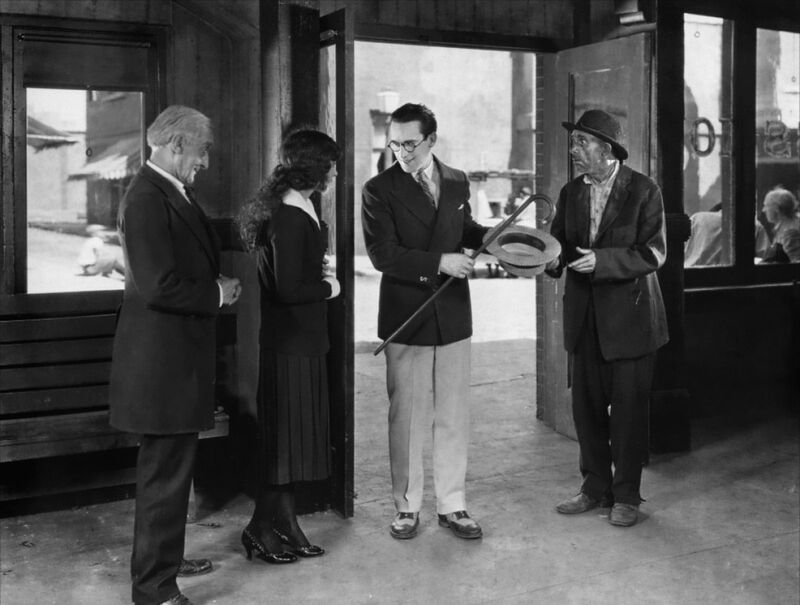 It is nice to see Harold Lloyd get the recognition he so richly deserves, ranking alongside Charlie Chaplin and Buster Keaton as a great comedic genius of the silent film era. For Heaven's Sake is a light, delightful comedy that has not just many wonderful moments of sight gags, but also a nice little love story within it. There is Uptown, where people are cursed with money, and Downtown, where people are cursed without it. In Downtown, Brother Paul (Paul Weigel) runs a coffee cart to minister to the rough world of the destitute and dreams of building a mission to further his cause. In Uptown, wealthy J. Harold Manners (Lloyd) lives in delightful obliviousness to all things. He's a basically good young man, but the type to think nothing of buying two cars on the same day after one is wrecked through no fault of his own. It's this that causes Harold to find himself entering Downtown. His car was commandeered by the police to try and catch jewel thieves, and after his car was wrecked he goes Downtown to try and make amends for the accidental damage. He unfortunately ends up setting Brother Paul's coffee cart on fire. As usual, Harold merely breaks out the checkbook and offers to pay for the damage. Unfortunately, Brother Paul misunderstands Harold's offer and thinks he is helping him pay for his longed-dreamed of mission, so he says a thousand dollars out to cover it. While Harold is slightly puzzled how much the cart costs, he gives him the check. Shortly thereafter, he is shocked to read about the "J. Harold Manners Mission" about to open. Horrified that his name is being used without his consent, he goes Downtown to stop the mission...until he catches sight of Brother Paul's beautiful daughter, Hope (Jobyna Ralston). Harold is instantly smitten with our innocent missionary, so he now is intent to help her out, in his own way. He manages to get the local ruffians into the mission, including the jewel thieves from before. They want to knock him out but, thanks to Manners' obliviousness, he ends up winning their respect. The Man With a Mansion and the Miss With a Mission fall in love and plan to marry, horrifying Manners' upper-crust friends. Determined to save him from this temptress, they kidnap him on his wedding day to stop his insanity. The ruffians think he's abandoned all of them and disappointed, get drunk. It isn't until they go to his club to punish him. Discovering he was being held against his will, they instead help get him to the mission on time, in a wild chase that involves trolleys, buses, and a dog catcher. All's well that ends well, as Harold and Hope marry. Lloyd was a master of sight gags, and For Heaven's Sake has many hilarious moments. There's one where during the police car chase, the somewhat unflappable Manners uses a hubcap for a helmet. Another funny moment is when he first goes to the mission. Being of a particular class it is natural for him to mistake a mission resident outstretching his hands as him asking for his hat and cane, which the homeless man mistakes as gifts. When Manners is leaving, the homeless man is returning, and Manners leaves the man speechless when he calmly takes back his hat and cane. The wild race to the altar at the end might not be on the level of Buster Keaton's Seven Chances, but it's still wildly hilarious and above all, logical. This is one of the qualities of For Heaven's Sake, which it shares with many silent films. There is a logic in how the situations play out, with the gags coming from the situations and characters, no matter how oddball either may appear. As Harold and the 'reception committee' race to the mission, they have to find ways to get there, while Harold has to keep his group of drunks in line somehow. As crazy as it all is, director Sam Taylor keeps things going without falling off the rails, most of the time. Sometimes the sight gags are either too forced, such as when Harold mistakes a dummy for one of his drunks, or too obvious, such as when Harold ends up putting a wedding ring on a dog's tail. That's a minor detail, but one nonetheless. What really sells For Heaven's Sake is Lloyd as our dilettante with a heart of gold. Lloyd plays him not as a selfish man, but more a clueless one, genuinely unaware of how his actions may appear eccentric. It's Harold's obliviousness and almost naive manner that sells For Heaven's Sake. We see that J. Harold Manners is actually quite a nice, well-meaning fellow. Even when he 'says' something rather odd like "I don't want to be late for my first wedding! ", you know he means something other than what the title cards imply. Ralston does not have much to her save the generally sweet young girl of many a Lloyd film, but she is allowed moments of anger, like when she berates Manners for taking down the 'J. Harold Manners Mission' sign, unaware of who he is. The film also makes good use of editing, such as the transition from the homeless man's coffee mug to the more refined coffee service at Harold's club. Curiously, Lloyd isn't the center of many of For Heaven's Sake stunts, but more an onlooker to the horrors others are either committing or about to commit. He does have some thrill moments, but mostly he isn't causing the chaos himself. 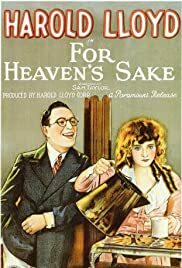 For Heaven's Sake is a nice, light romp that will delight longtime Harold Lloyd fans and give newbies an introduction into one of the great silent film stars.